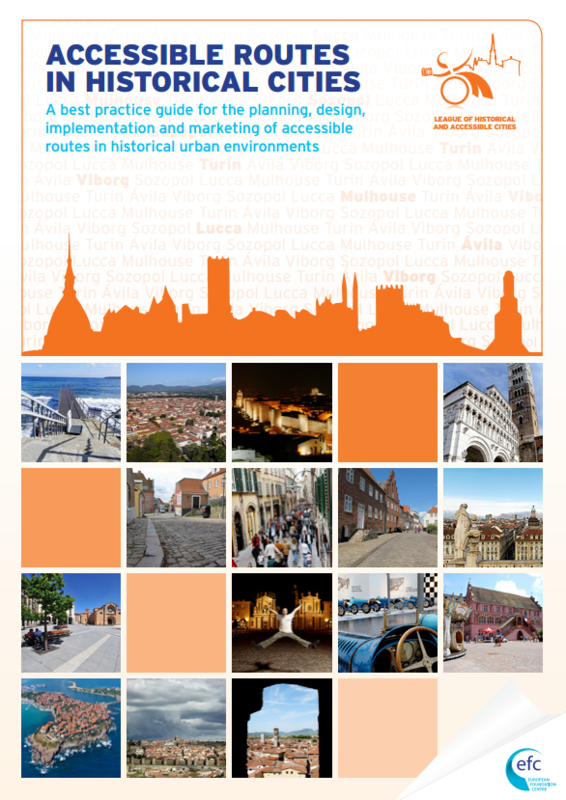 Fondazione Banca del Monte di Lucca and Promo PA, in the framework of LuBeC 2013 organized on the 18th October 2013 the workshop "The city for all: leave, learn and accessible to move". LuBeC is a yearly event organized by Promo PA, an Italian research foundation operating in education and Cultural Heritage. It is an exhibition of tech solutions made available in the Cultural Heritage area, aiming at increasing its value and the local territory promotion through discussions on brand new topics and projects every year. On that occasion the LHAC best practice guide was presented for the first time - by Alicia Barragan Iturriaga from Via Libre, as a tool for actors and stakeholders in other historical cities – including foundations, public authorities, chambers of commerce, tourist destination managers, heritage associations, disability organisations and others – who are interested in exploring and examining the possibility of establishing similar accessible routes. The League of Historical Accessible Cities LHAC and the European Consortium of Foundations on Human Rights and Disability discussed the state of the art of projects, processes already initiated and future actions to be taken together with politicians, local authorities, associations, persons with disabilities and other stakeholders. After the welcoming words of Alberto Del Carlo, Chairman of Fondazione Banca del Monte di Lucca and Giovanna Cagliosto, Prefect of Lucca, Miguel Angel Cabra de Luna (European Consortium of Foundations on Human Rights and Disability co-chai) presented the study "Assessing the Impact of European Governments’ Austerity Plans on the Rights of People with Disabilities". The study focuses in particular on the negative impacts that recent cuts made by a number of European governments have on people with disabilities and their families. Subsequently, Donata Vivanti, European Disability Forum of the Italian Federation for Overcoming Disability (CFISH) Vice‐President gave an overwiew on the impact of those austerity measures in the Italian situation. Furthermore some comments were added by Giuseppe Terranova, National Vice President of the Italian Union of the Blind and Visually Impaired People. After that, Alessandro Biancalana, President of the Opera Walls of Lucca and Giuseppe Stolfi, Superintendent of fine arts for the provinces of Lucca and Massa Carrara presented Lucca as a good example of Governance in terms of accessibility. In the final part of the conference the concrete cases of Lucca and the League of accessible and Historical ciites were presented respectively by Elizabeth Franchini (Fondazione Banca del Monte di Lucca) and Alicia Barragan Iturriaga (Via Libre).